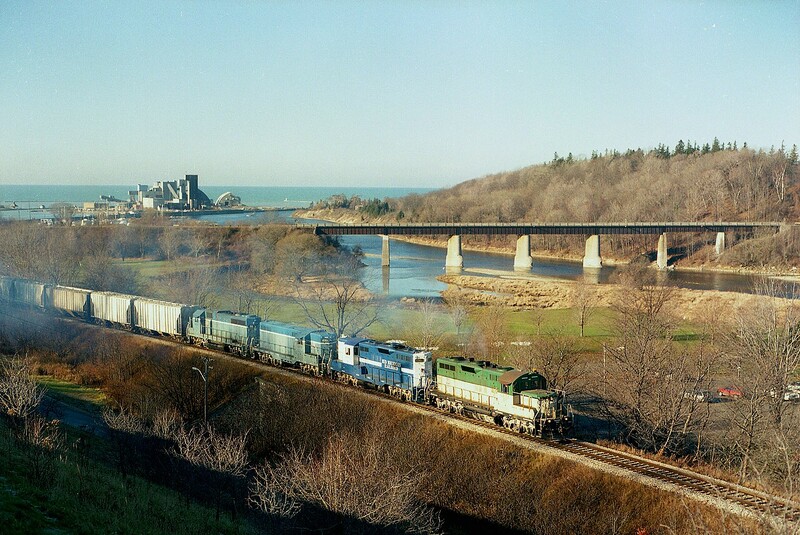 Railpictures.ca - A.W.Mooney Photo: An old once familiar scene at Goderich. GEXR 177, Mid-Michigan RR 5967, GEXR 4161 (slug), GEXR 66 (slug mother) drag a load of salt up from the Sifto Salt complex seen on the shore of Lake Huron in the background. The bridge over the Maitland River is the former CP connection to the town, now used as a hiking trail. The CP up and left about 10 years prior to this photo being taken. I believe all locomotives in this image were scrapped in 2008. The MMR 5967 was loaned to GEXR on 10/97 and departed for CBNS in early 1998, so this was a bit of a rare catch. | Railpictures.ca – Canadian Railway Photography – photographie ferroviaire Canadienne. Caption: An old once familiar scene at Goderich. GEXR 177, Mid-Michigan RR 5967, GEXR 4161 (slug), GEXR 66 (slug mother) drag a load of salt up from the Sifto Salt complex seen on the shore of Lake Huron in the background. The bridge over the Maitland River is the former CP connection to the town, now used as a hiking trail. The CP up and left about 10 years prior to this photo being taken. I believe all locomotives in this image were scrapped in 2008. The MMR 5967 was loaned to GEXR on 10/97 and departed for CBNS in early 1998, so this was a bit of a rare catch. Yep, trees everywhere according to the google street view.Too bad, its a great spot. Love it! Is this area still possible to shoot? or is it run over by weeds now? Awesome, classic GEXR Geeps, I never managed to catch the mid Michigan unit. Love this location ! Thanks, snake. PS: What are you doing slithering around today? It is tooooo cold for snakes yet.